Tired of having your Guild Leader berate you for not wearing the guild tabard? Ever been caught wearing the wrong tabard? Or have no wish to actually even wear a tabard unless forced to? This is the addon for you! -- you have the ability to set which players to look out for as group leaders for each guild. 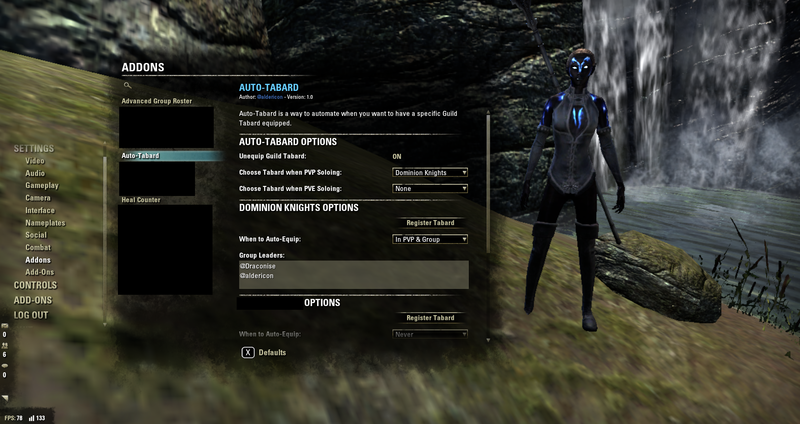 For example, I set '@aldericon' and '@Draconise' as Group Leaders for Dominion Knights. This means that whenever one of those two players are group lead, I'll equip the Dominion Knights tabard. However, if it switches to a player not listed - unless I have them listed for another guild and if I have the 'Unequip Guild Tabard' option on - the addon will un-equip my currently equipped tabard. Since each guild tabard is simply named 'Guild Tabard', in order for the addon to know which tabard belongs to which guild, you will need to set-up the addon at first by equipping each guild tabard and clicking the 'Register Tabard' button under the appropriate Guild Settings in the Addon Settings. If you don't use all the guild tabards, simply don't register one. Note: There is nothing in the code that looks specifically to make sure you're using a Guild Tabard. 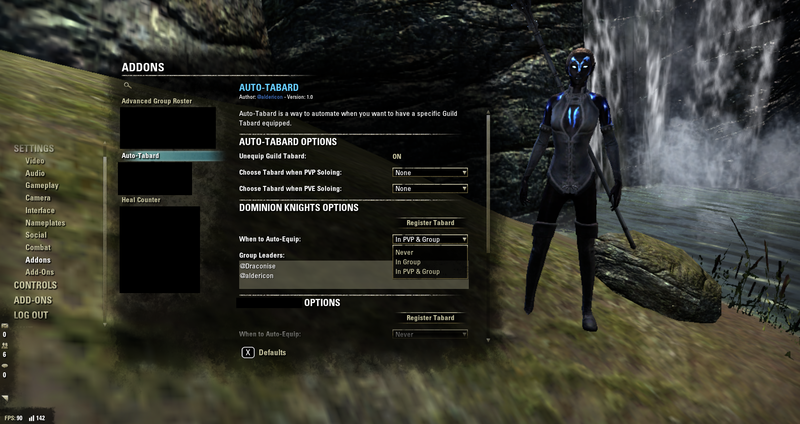 So, technically, you can use this addon for any costume and have it associated with these actions / a guild. If you have any question or comments, feel free to post here or mail me in game at '@aldericon'. I am always looking to build new features into my addons. .... Keep me updated if you find anything else! I'm not sure I'll be able to debug this properly without experiencing the error myself. If you continue getting it, I recommend removing the addon + saved variables for the addon and then re-installing it. Last edited by cag_dk : 11/25/18 at 06:56 PM. Thanks for notifying me; I went ahead and fixed the bug today in the addon. Keep me updated if you find anything else!